In the film's opening set in the year 2263, the Federation's USS Enterprise - NCC-1701 - glided into view, commanded by Captain James T. Kirk (Chris Pine). On the planet of Teenax, he was brokering peace treaty talks between the Teenaxi people and their enemies, the Fibonan Republic. While presenting an ancient artifact (a piece of a weapon, known as an Abronath) that he claimed was a peace gift from the Fibonans, the Teenaxi leader (Shea Wigham), a creature the size of a cat, considered it a threat. When attacked by the alien creatures, Kirk requested from chief engineer Montgomery "Scotty" Scott (Simon Pegg) to be beamed back onboard the Starship Enterprise. During transport, two Teenaxians were taken with him. Captain's log, Stardate 2263.2. Today is our 966th day in deep space, a little under three years into our five-year mission. The more time we spend out here, the harder it is to tell where one day ends and the next one begins. It can be a challenge to feel grounded when even gravity is artificial. But, well, we do what we can to make it feel like home. The crew, as always, continues to act admirably despite the rigors of our extended stay here in outer space. And the personal sacrifices they have made. We continue to search for new life forms in order to establish firm diplomatic ties. Our extended time in uncharted territory has stretched the ship's mechanical capacities. But fortunately our engineering department, led by Mr. Scott, is more than up to the job. The ship aside, prolonged cohabitation has definitely had effects on interpersonal dynamics. Some experiences for the better, and some for the worse. As for me, things have started to feel a little episodic. The farther out we go, the more I find myself wondering what it is we're trying to accomplish. If the universe is truly endless, then are we not striving for something forever out of reach? The Enterprise is scheduled for a reprovisioning stop at Yorktown, the Federation's newest and most advanced starbase. Perhaps a break from routine will offer up some respite from the mysteries of the unknown. In the ship's bar while drinking Saurian brandy and Scotch, Kirk and Dr. "Bones" McCoy spoke about Kirk's upcoming birthday (the day of his father George Kirk's death), that he noted would make him now one year older than his father when he died. He was struggling to find meaning regarding his duties as Captain and his endless years of exploration, as McCoy reminded him: "You spent all this time trying to be George Kirk and now you're wondering just what it means to be Jim. Why you're out here." The Enterprise arrived and docked at Yorktown, a massive Starbase space station with colossal rings (where intergalactic races lived and mingled), to replenish their supplies. As they disembarked, Lieutenant Nyota Uhura (Zoe Saldana) attempted to break up with boyfriend Spock by giving back the gift of a necklace-amulet, but he refused ("It is not in the Vulcan custom"). Spock was informed by Vulcan ambassadors that Ambassador Spock Prime, his older self and Alternate Reality counterpart from the original timeline, had died. Helmsman Lieut. Hikaru Sulu (John Cho) also greeted his spouse-husband-partner Ben (Doug Jung) and their young daughter. We were on a science mission inside the Nebula. Our ship suffered a critical malfunction. I took an escape pod, before the ship crash-landed on a nearby planet [Altamid]. We need a ship capable of navigating the Nebula. You must have someone who can help us. Captain Kirk was informed about the dangers involved by Yorktown's commanding officer, Commodore Paris (Shoreh Aghdashloo). Earlier, Kirk had applied for a promotion to the position of Vice Admiral on the Yorktown, and recommended that Spock replace him as Captain of the Enterprise. She deflected his recommendation and urged that he continue as Captain for the time being: "I'll bring it up with the General Council. We'll discuss it when you return." "Our mission is straightforward. Rescue a crew stranded on a planet in uncharted space. Our trajectory will take us through an unstable Nebula, one which will disable all communications with Starfleet. We're gonna be on our own." After traveling through a cluster of asteroids and moving through the rock-filled Nebula, the Enterprise emerged near the Earth-like planet of Altamid, a Class-M planet where Kalara's ship had reportedly crash-landed and became stranded. The starship was suddenly ambushed and attacked by a large bee-like swarm of small alien ships, led by Krall (Idris Elba). During a counter-attack, the Enterprise's phasers and torpedoes had limited effect as did its thrusters and shields according to Navigator Ensign Pavel Chekov (Anton Yelchin), and the starship was soon crippled and its hull was breached (many crew members were shot dead and had their life forces drained). The swarm's leader Krall, an armored, hairless alien with prominent facial ridges, boarded the Enterprise to search for the ancient relic-artifact, the Abronath, that Kirk had offered to the Teenax people in the opening scene. He located the artifact in the archive vault and removed it. However, when the ship violently tilted, the box holding the artifact was dislodged from Krall's hand. Kirk was able to acquire the Abronath, and after ordering the crew to abandon ship, he entrusted the artifact (removed from its box) to Ensign Syl (Melissa Roxburgh), as the Enterprise's saucer crumbled into pieces and then crash-landed on Altamid, in a forest of evergreen trees. Spock and Bones and other main crew members were able to evacuate and eject themselves in various spacecraft modules-crafts and escape pods. On the surface of the planet, survivors included Kirk, Chekov, Kalara, Bones and Spock who had escaped in separate pods - but the remainder of the crew (including Sulu and Uhura) were soon captured by Krall, and taken to his base of operations-headquarters for questioning by his soldiers. Scotty's escape pod landed separately from everyone else, on a cliff's edge. After landing, Kirk confronted Kalara and accused her of collusion with the aliens: "You knew we'd be attacked." She admitted that she had lied, but had only acted to save and protect her crew when earlier attacked by Krall. The trio of Kirk, Chekov, and Kalara departed to begin a search, and soon found the crashed saucer section of the Enterprise in a valley. Elsewhere, Bones and Spock emerged from the crash wreckage of their hijacked space-pod, revealing that Spock was badly-wounded and had a piece of metal debris embedded in his abdomen. Bones ripped out the metal piece, then cauterized the wound with a heated rock shard. Afterwards, as they ventured through peaks of rugged rocks, they came upon a cave-like enclosure where Spock surmised that the artifact had originated from there due to similar symbol-markings on the walls. Meanwhile, Scotty found himself surrounded and about to be attacked by the planet's unruly and brutish creatures, when he was saved and rescued by another alien named Jaylah (Sofia Boutella), a white-haired female scavenger. At knifepoint, he identified himself to her as a Starfleet engineer ("I fix things") - and she lowered her weapon. In exchange for helping him to find his crewmates, she insisted that he help her "fix something." She led him to her makeshift home - the previously-crashed remains of an Enterprise-class starship, the USS Franklin, that disappeared about a hundred years earlier. Her intent was to have him fix it - so that she could "leave this planet forever." Chekov, Kirk, and Kalara approached the severely-damaged Enterprise saucer, entered the bridge, and found that the console still functioned. They attempted to activate scanners to locate the other surviving crew members. And then Kirk claimed to Kalara that he had hidden the Abronath artifact on the saucer in a compartment in the corridor. At that instant, Kalara kneed Kirk in the face, then held a phaser weapon on him, and radioed to Krall's base: "Tell Krall I have the Abronath." But when she looked in the compartment, it was empty - Kirk had tricked her into confirming that her "sad story" was false about a crew and a crash-landed ship, and that she had traitorously been allied as a spy with Krall from the very start, to lure them there. Chekov appeared and turned the tables by holding a weapon on Kalara, but two of Krall's drone soldiers ambushed the two Starfleet officers, joined her and gave chase after them through the saucer's corridors. Chekov engaged and activated the craft's thrusters after Kirk ignited the fuel tanks, lifting up the saucer and causing it to completely flip over, crash down and crush Kalara (and the other drone-troopers) to death. But the Enterprise was left in fiery ruins. "The coordinates were altered. Your rescue ships will be stranded in the Nebula, and your base left vulnerable...Millions of souls from every Federation world holding hands. It's a perfect target." Krall then demonstrated his remarkable ability of energy transference - to drain the life force from two hapless Enterprise crew members who were hanging upside down, in order to rejuvenate and prolong his own life and alter his appearance (making his alien features less pronounced). Back in the cave, Spock spoke to Bones about Ambassador Spock's death, and explained how he had been reconsidering his place in the Starfleet, and wanted to carry out his older self's work: "When you've lived as many lives as he, fear of death is illogical....I want to live as he did. That is why I decided to redirect my efforts and continue his work on New Vulcan." He had contemplated leaving the Starfleet, but avoided telling Kirk who would probably object. When Spock began to laugh, Bones worried: "Oh my God, you're getting delirious." As Chekov and Kirk proceeded through the forest, they set off one of Kaylah's traps - a brownish-gas enveloped them and encased them in a crystalline shell of resin. Scotty identified his "mates" for Kaylah, who released them, and they all returned together to the USS Franklin. Scotty complimented Kaylah on repairing the vessel: "Kaylah has done a marvelous job of getting the ship's systems back online." The group attempted to track other crew members from the ship's sensor. Kaylah demonstrated how she had set up image refractors to create a "holographic camouflage" - to invisibly shield the ship from being detected. Through the ship's transmission system, Bones and Spock were located, but they had also been identified by three swarm ships that zoomed toward them. When they were threatened, both were teleport-beamed away separately (rigged by Scotty) to the pad in the transporter room of the USS Franklin, where they were reunited with Scotty, Kirk, and Chekov. Although collapsing from loss of blood, Spock explained their discovery that the Abronath artifact had come from Altamid. Krall intimidated his captive Enterprise crew members to learn the whereabouts of the Abronath artifact. When he threatened to drain Sulu's life energy, Ensign Syl was coerced into relinquishing it. She had hidden it behind finger-like spikes in the back of her skull. Krall placed the Abronath in the middle of a ring-shaped device (within a dark liquid) in his tech-room, where it began to glow red. "You can not go to this place. Everyone who goes there he kills....If your friends are there, then they will die, just like my family. And I will not go back to that death place...If you choose to do this, you are on your own." She described how Krall's right-hand man Manas (Joe Taslim) had killed her brave father, in order to save her life. However, she agreed to help their crew's break-out plan by describing an internal tunnel that entered-exited the crater of Krall's base. Scotty described how they could use a beacon to beam out 20 crew members at a time into the USS Franklin. To create a diversion, Kirk (with Jaylah holding on) sped on a PX-70 motorcycle (found on the Franklin) toward Krall's base. Meanwhile, Krall showed off the Abronath to Uhura and Syl in a chamber - "it was used by the Ancient Ones as a weapon." He told them how the ancient, deadly super bio-weapon was originally split into two halves and ejected into space, but now the two halves were reunited. Syl was trapped in the locked chamber while Krall activated the reassembled weapon in a recessed area of the chamber's closed door. A black liquid was released into the chamber that wrapped around Syl and disintegrated her. Uhura watched as Syl's body completely decomposed or dissolved. He then told Lieutenant Uhura his plan for the weapon - to defeat the Federation and destroy Starbase Yorktown. Suddenly, Kirk and Jaylah entered on the cycle through the crater's tunnel to create a distraction within Krall's base. Multiple holographic images of Kirk spun around the interior of the crater area, as Spock and Bones were also teleported to the site, to rescue large groups of captive crew members by teleportation. Kirk protected the crew by spreading a crystallizing resin material to shield them from enemy-fire by Krall's soldiers. Jaylah also functioned as a sniper to protect Kirk from soldiers with phasers. However, she was forced to engage in a one-on-one fight with Manas, who threatened: "You will die here, just like your father." During the rescue operations, Krall flew off into space toward Yorktown with his Abronath bio-weapon - accompanied by a massive Swarm of spacecraft drones in a swirling vortex. At the exact moment that Jaylah pushed Manas off a pad to his death, she jumped to miraculously reach Kirk on his bike as he activated his pulse-beacon, sending them both back to the Franklin (they were the last crew members to be rescued). The Enterprise survivors took Jaylah's advice to launch the Franklin into space to pursue Krall, to prevent him from destroying the Yorktown space-station and other Federation planets: "You take my house and you make it fly." Once the shield was removed, the weathered-old starship - helmed by Sulu - nose-dived off its cliffside perch as stabilizers fired, and then it soared skyward through rocky crags into space. A red-alert was issued when the Yorktown's central control observed Krall's massive swarm of drones approaching to initiate an attack. Spock deduced that the drones' complex swarm formations had to be coordinated via radio frequency signals ("a cyberpathic link") that could be jammed and disoriented. To disrupt the coordinated signals and cohesiveness of the drone fleet, Spock and Bones first beamed onto one of the drone ships, then broadcast (via VHF, at 57.7 mghz) the loud, distracting, and discordant music of the Beastie Boys' 1994 rock song Sabotage (one of Jaylah's "classical" music recordings) in a "multiphasic sweep" to obliterate most of the fleet. As the Franklin cruised through a funnel of burning flames caused by a cascade of drone-swarm collisions, Krall's ship and two other surviving underling ships, after being pursued by Bones' and Spock's stolen swarm drone, entered into the Yorktown space station, and were struck by the belly of the starship Franklin as it sank into a water fountain in the central plaza-square of the main city, near headquarters. Three hull breaches from the impact of Krall's ships and the Franklin were reported. Kirk ordered that they check to see whether the Abronath was neutralized and if Krall was dead. They discovered that Krall had survived the crash by draining and transferring the life force of a few hapless Enterprise crewmembers. As they continued onward to find Krall, who had fled somewhere within the starbase, a monitor played a video recording of the original crew of the Franklin from centuries earlier. Uhura studied the recording, rewound it, and realized that the Franklin's former, pre-Federation human captain was a bald-headed, black-skinned human named Balthazar Edison - it dawned on her: "Edison is Krall" himself. The USS Franklin's database was accessed to reveal that Edison existed long before the Federation. He was a Major in the United Military Assault Command Operation (MACO), and engaged in a lot of "off-world combat" as a "pretty good" soldier. His service ended when MACO was disbanded. He was made a captain and given the Franklin. Captain's log. I don't remember the Stardate. All distress calls unanswered. Of the crew, only three remain. I won't allow it! The indigenous race abandoned this planet long ago. They left behind sophisticated mining equipment and a drone workforce. They have some sort of technology that prolongs life. I will do whatever it takes for me and my crew. The Federation do not care about us. You'll probably never see me again. But if you do, be ready. We lost ourselves, but gained a purpose! A means to bring the galaxy back to struggle that made humanity strong....I fought for humanity! Lost millions to the Xindi and Romulan Wars. And for what? For the Federation to sit me in a Captain's chair and break bread with the enemy. The two fought for possession of the Abronath in anti-gravity and weightless conditions within the atmospheric regulator and the slipstream in the core. Krall powered up and activated the Abronath bio-weapon disk and tossed it into the regulator chamber, causing its black liquid cloud to spread out. Scotty warned: "We have to stop the processor now, or everything breathing in Yorktown is dead!" Scotty elected to eject the device out of the Yorktown into space, using the override system. This required that Kirk activate or open four hatches in the chamber. As Kirk struggled to open the stubborn fourth hatch, Krall/Edison and the device (with black liquid swarming around him) were sucked through the main vent, ejected into the core and its main shaft, and then propelled into space - he was soon devoured, disintegrated or consumed. With their hijacked alien drone ship, Spock and Bones flew in to save Kirk from also being taken into space through the shaft. Kirk complimented Spock for the rescue ("What would I do without you, Spock? "), causing the Vulcan to reconsider his decision to leave the Starfleet. Afterwards, in the office of his commanding officer, Kirk and Commodore Paris studied images of the USS Franklin and its crew - now marked "CASE CLOSED." She noted: "For decades, the Federation taught that he was a hero. I guess time will judge us all." Kirk was somber: "He just got lost." Kirk was congratulated for saving the entire base. He was offered the position of Vice Admiral, but Kirk respectfully decided to remain in his role as a Captain ("Vice Admirals don't fly, do they?...Where's the fun in that?"). Elsewhere, Spock was searching through some of the personal effects of deceased Ambassador Spock in a box, including an illuminated photograph of the earlier Enterprise crew (from Spock's Prime timeline) on the bridge. Alien despots hell-bent on killing us? Deadly space-borne viruses and bacteria? Incomprehensible cosmic anomalies that could wipe us out in an instant! He led Kirk into a surprise birthday party, where all the crew had been assembled to celebrate. It appeared that Spock repaired his romantic relationship with Uhura, and Scotty informed Jaylah that Kirk had "pulled a few strings" to get her accepted in the Starfleet Academy. Together, many of the crew watched progress on the construction of a new USS-Enterprise-NCC 1701-A ship, shown in rapid time-lapse. The main crew members took turns reciting the original "Final Frontier" monologue in the film's epilogue, as they resumed their mission and soared off into space, upon the ship's completion. Captain James T. Kirk: Space, the final frontier. Lieutenant Uhura: To boldly go where no one has gone before. After the film's major title credits, the words "In Loving Memory of Leonard Nimoy" and "For Anton" were shown on a black background. The thirteenth film of the entire series. 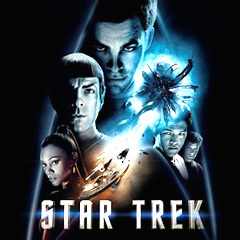 Many of the actors from the previous film returned to play their roles, including Chris Pine as Captain James T. Kirk and Zachary Quinto as Commander Spock. In terms of chronology, the film took place approximately two and a half years after the events of the previous film, Star Trek Into Darkness (2013). There were no opening credits - making it the fourth consecutive Star Trek film to not list the cast at the start of the film. It was notable as the first Star Trek feature to be shot entirely digitally, and the first to be mostly shot outside of Hollywood (in Vancouver, BC, Canada). Academy Award Nominations (no win): Best Makeup. With a production budget of $185 million, with box-office gross receipts of $158.9 million (domestic) and $343.5 million (worldwide).